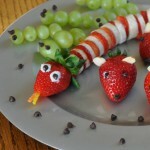 Our days have been filled with fun and exciting travel plans, but when we are home the kids love to “cook.” We have spent lots of time making fun and yummy snacks. 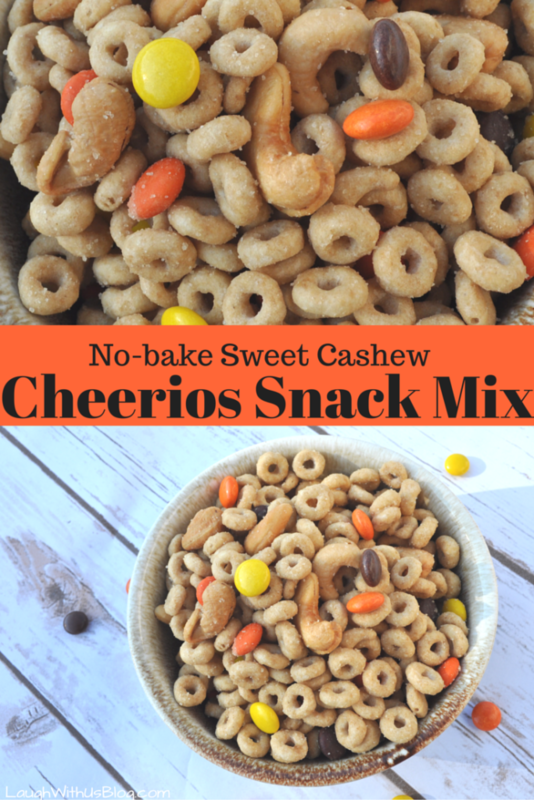 This Sweet Cashew Cheerios Snack Mix is one that Grace made and everyone was crazy about it! 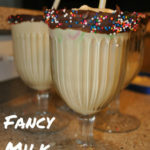 We were going for a fun movie night snack and this was a huge hit! 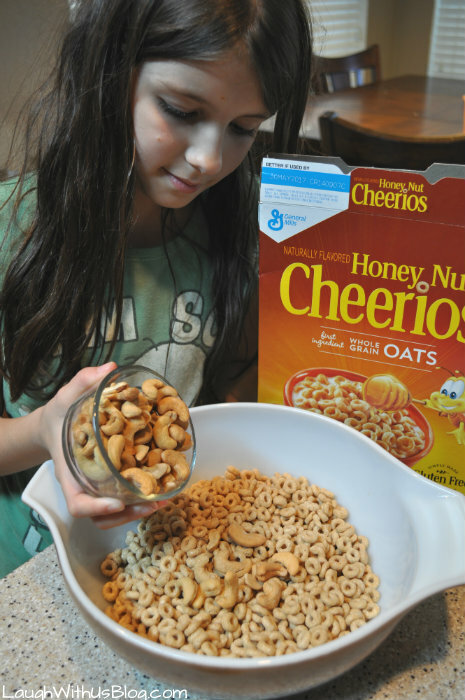 Measure the Cheerios and cashews in a large microwaveable mixing bowl. Melt the butter in the microwave in a small (2 cup) glass bowl. Mix in the brown sugar, maple syrup, and vanilla. Microwave on high 30 seconds or until the mixture begins to boil. 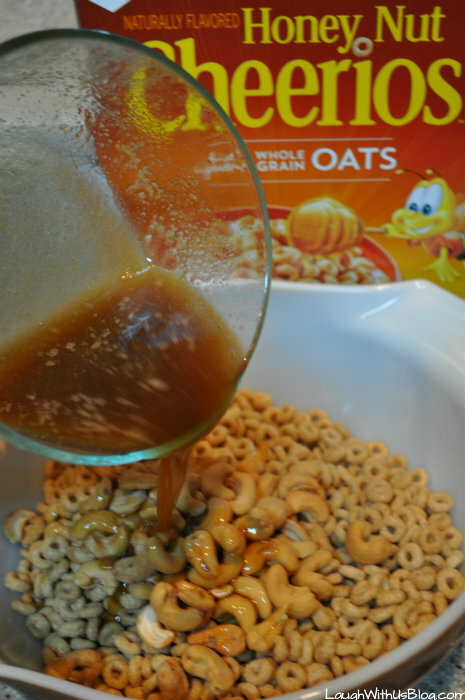 Pour the butter mixture into the Cheerios and mix to coat. Microwave on high uncovered 3-4 minutes stopping to stir every minute. 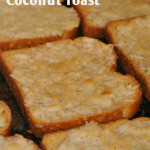 Spread onto a wax paper or foil lined cookie sheet to cool. When cool transfer the snack mix to a serving bowl and mix in the Reeses Pieces. Enjoy! 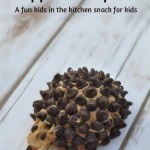 We loved this super easy to make snack mix. Standard time to make it would be about 15 minutes. It takes a little longer with little hands measuring and stirring, but not so long they get too tired, and the definitely love eating their creation! 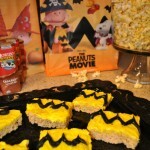 A delicious movie night snack and perfect no-bake KidsInTheKitchen recipe. Melt the butter in the microwave in a small (2 cup) glass bowl. Mix in the brown sugar, maple syrup, and vanilla. Microwave on high 30 seconds or until the mixture begins to boil. 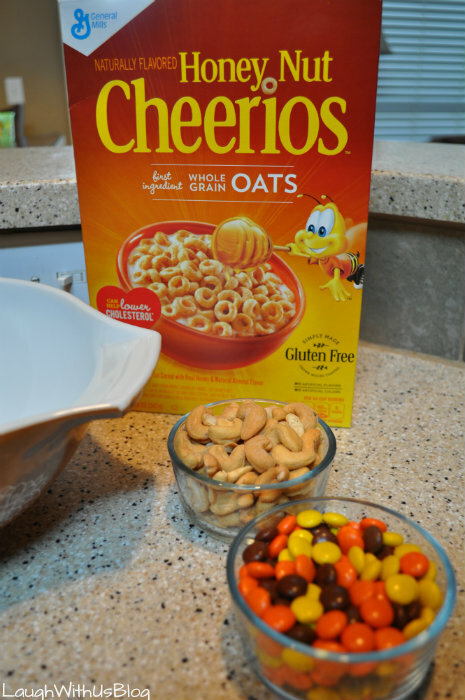 Pour the butter mixture into the Cheerios and mix to coat. Microwave on high uncovered 3-4 minutes stopping to stir every minute. Spread onto a wax paper or foil lined cookie sheet to cool. 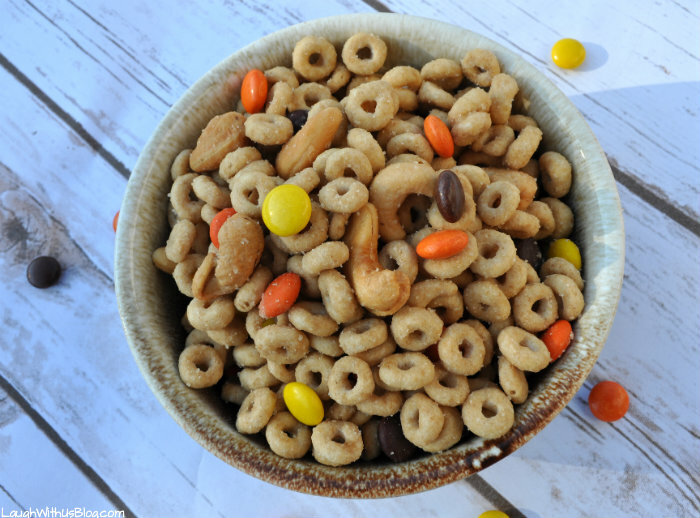 When cool transfer the snack mix to a serving bowl and mix in the Reese's Pieces. That looks yummy. 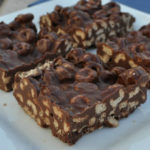 I just made a similar mix with chex mix, but I think we would like this one with cheerios too.